Chiles Toreados are perfect for any Mexican food feast. They can be cooked days ahead of your party, kept in the fridge, and just before serving, add lime juice and salt. Done! The Texas Mexican region has the honor of being considered to be the original site of the birth of chiles, scientific name capsicum annum, according to a convergence mapping of archaeological, ecological, linguistic and genetic evidence. There’s a cave in the state of Tamaulipas (think near Brownsville, Harlingen, McAllen) that has strong archaeological evidence indicating the birthplace of our chile, 7,000 to 9,000 years ago. That’s Romero’s Cave (1). Moreover, genetic evidence gives the strongest evidence that the chile originated in southern Texas and northeastern Mexico. 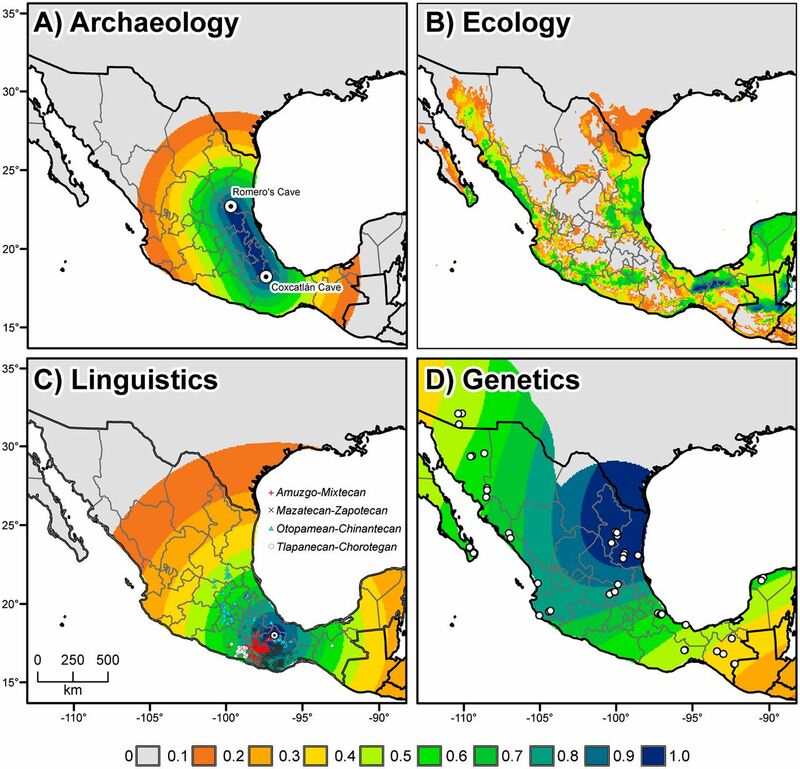 Ecological evidence, along with linguistic evidence give less weight to the Texas Mexican region, but in those mappings it is still considered to be present to a significant degree. So, when making this delicious recipe, take a moment and think about the hundreds and thousands of years that people before you have domesticated and enjoyed chiles. 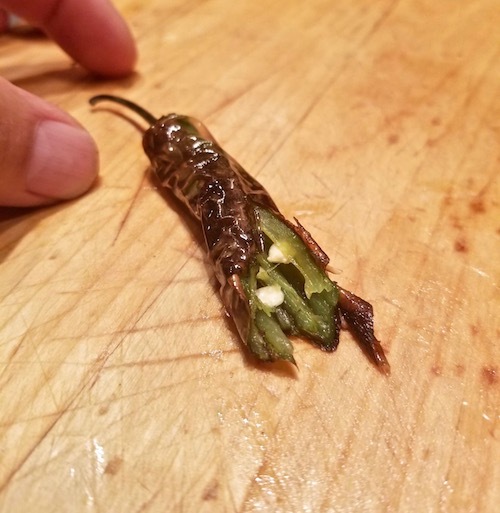 I deseed the chiles so that the capsaicin, that’s the chemical that burns the skin, is significantly reduced and I can better taste the flavor of the chile. There’s really no recipe, just these easy steps. 1. Slice the chile Serrano or chile Jalapeño in half and remove the seeds and the membranes. Use gloves to do this, if you have some, otherwise handle them with a fork and knife and try not to touch the chiles too much, because you may wipe your eyes or nose later, causing extreme pain. 3. You can eat the chiles just like that, or place them in a bowl and squeeze lime juice all over them. Add salt to taste. I serve these chiles with all kinds of tacos and especially with grilled meats or fajitas. Some people don’t deseed the chiles, wow they’re hot. 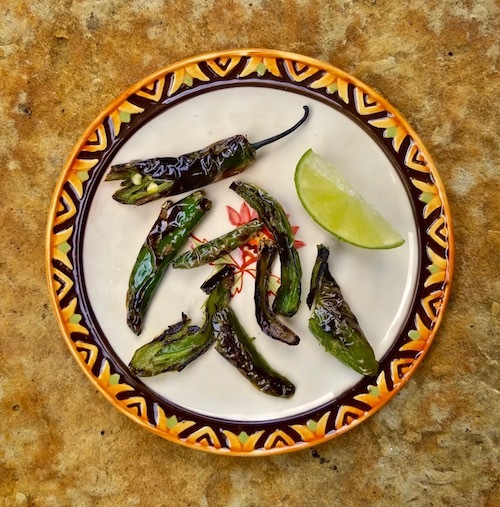 You can also fry the chiles intact, so that they make an impressive visual presentation, and let your guests slice and deseed them on their plate. “Multiple lines of evidence for the origin of domesticated chili pepper,Capsicum annuum,” in MexicoKraig H. Krafta,1, Cecil H. Brownb, Gary P. Nabhanc, Eike Luedelingd, José de Jesús Luna Ruize,Geo Coppens d’Eeckenbruggef, Robert J. Hijmansg, and Paul Geptsa,2, December 4, 2013.